A spicy tomato based sauce with onions, red and green peppers. A TASTE OF INDIA With juicy peppers and kalonji seeds for a vibrant spicy flavour. 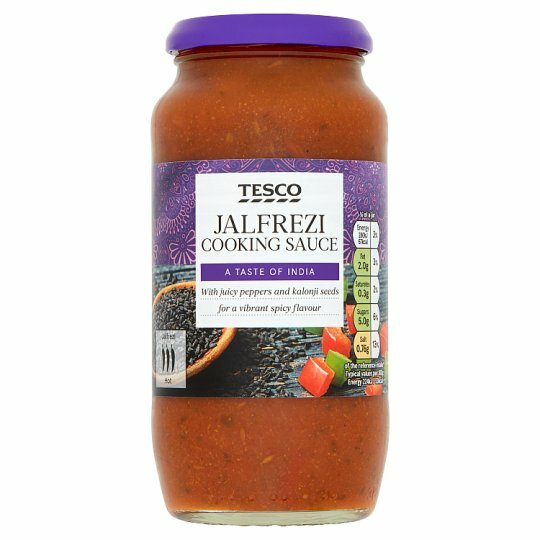 INGREDIENTS: Tomato Purée (30%), Water, Pepper (14%), Onion, Tomato, Modified Maize Starch, Rapeseed Oil, Sugar, Ground Coriander, Coriander, Salt, Ground Cumin, Concentrated Lemon Juice, Ground Fenugreek, Dried Chilli, Rice Flour, Onion Purée, Mustard Powder, Kalonji Seeds, Acidity Regulator (Lactic Acid, Acetic Acid), Ground Ginger, Ground Turmeric, Paprika, Chilli Powder, Ground Fennel, Ground Cardamom, Ground Cassia, Garlic Powder, Ground Clove, Cumin Seed, Black Pepper, Ground Bay Leaf, Ground Nutmeg, Onion Powder.